North Summit High School senior Sadie Sargent is not a basketball player. At least, not anymore. At 5-foot-5 and 100 pounds, she finds it’s a tough sport for her to contend in, but during her freshman year it was her go-to game. “I wasn’t going to do cross-country, and I wasn’t going to play volleyball; I was just going to wait until basketball season,” Sargent said over the phone on Wednesday. Then a friend convinced her to try cross-country running, and her whole outlook as an athlete changed. By convincing her to run, her friend cast Sargent on a journey that earned her two Class 2A state championships and, as of Monday, the Gatorade Player of the Year award for cross-country. 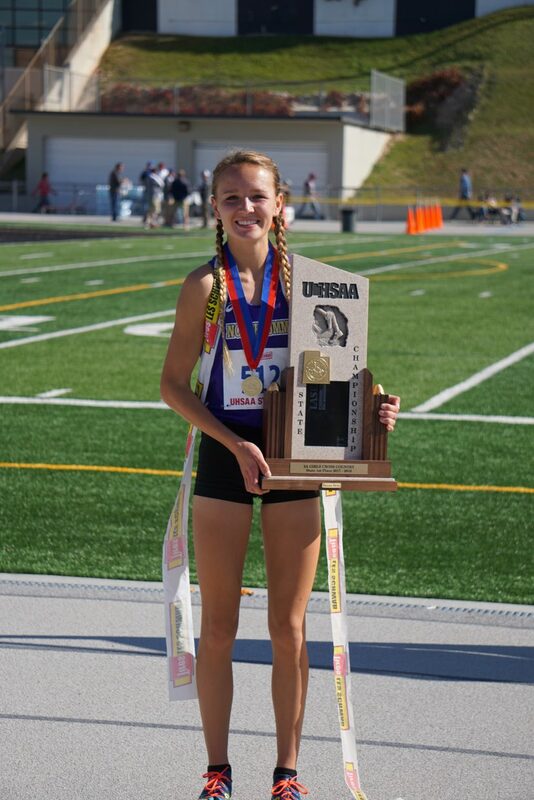 She will run cross-country at Brigham Young University next fall, but she has come a long way as a runner. “The first day I wanted to die because I was so bad,” Sargent said. But she learned quickly and started finding success in her first season. “In the third cross-country race, I went out and just never slowed down,” she said. Teammates advised her not to run flat out or she would run out of energy, but remarkably, she didn’t tire and she won. For a months Sargent still thought of cross-country as a way to prepare for basketball. She set the record for fastest state time as a freshman in the girls 5K. During her sophomore year, she started to realize that maybe cross-country was something of a calling for her. She came in second in state again and didn’t return to basketball her junior year. She said it wasn’t hard to break the news to her basketball teammates. Her experience with running could hardly have been more different from her basketball experience. She won the Class 2A state championship by 37 seconds as a junior and was in the top four finishers of any class level. She also set another record for fastest sophomore and junior times at the Class 2A state championship. Sargent aimed for loftier goals for her senior year last fall and decided she wanted to win every Class 2A championship-qualifying race she competed in, plus the championship race itself. Remarkably, but maybe not surprisingly, she did. And she expanded her margin of victory at the Class 2A state championship to a full minute. She also had the fastest time of any female racer of any school in Utah. But the real test came after the season, when she traveled to the Nike Cross Southwest Regional meet in Casa Grande, Arizona, which drew the best runners from Colorado, Nevada, New Mexico, Arizona and Utah. She placed fifth, and her result there — a 17-minute, 19-second finish — qualified her for the Nike Cross Nationals in Portland, Oregon, where she would compete with the best from around the country. According to Amber, Sargent lingered in a pack around 19th place for the first two miles. “It was so muddy that the girls in front of me, they were kicking up mud and it was hitting me in the face. Sometimes I couldn’t see,” Sargent said. In the last mile, she broke free and finished seventh out of 198. Back at North Summit, Sargent was anxiously awaiting word about her nomination as the Gatorade Player of the Year. She said she started to become a nuisance to her guidance counselor, and frequently checked in with him to see if he had received any indication of her status. Eventually she saw an announcement on Twitter that listed her name as a winner, and the next morning, Sargent’s principal waited for her in the hallway before school. “Sadie, I’ve got something for you,” he said, pulling out an orange backpack with the words “Player of the Year” across the back. “Well, it just kind of was the cherry on top,” Sargent said. In addition to her backpack, Sargent was awarded $1,000 to donate to an athletic charity of her choice, which she has not yet selected. She hasn’t broken in the backpack yet.